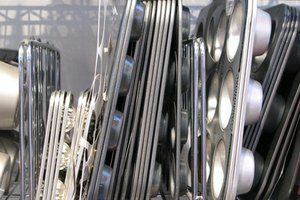 Aluminum bakeware conducts heat evenly and is generally easy to clean. Cooking dishes containing tomatoes, which have high acidity, in an aluminum pan can cause a metallic aftertaste to the food. The acid in tomatoes reacts with the metal of the pan, so when cooking a dish that has a lot of tomato sauce, such as lasagna, it's important to create a barrier between acid and metal. Lining the pan with parchment paper keeps any unpleasant flavors from leaching into your food. 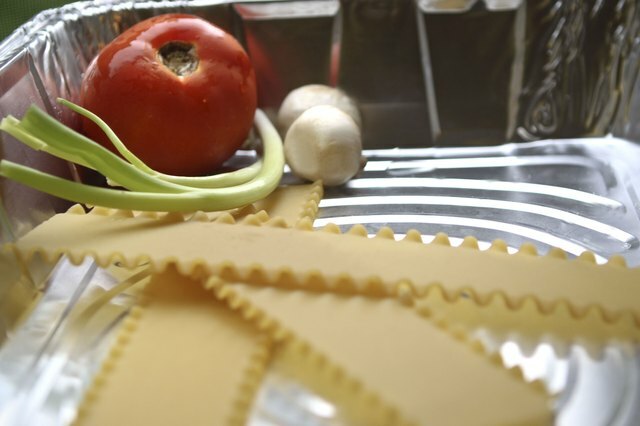 Here is one lasagna recipe that you can prepare and cook in an aluminum pan. You can also use your own lasagna recipe in a properly prepared aluminum pan. 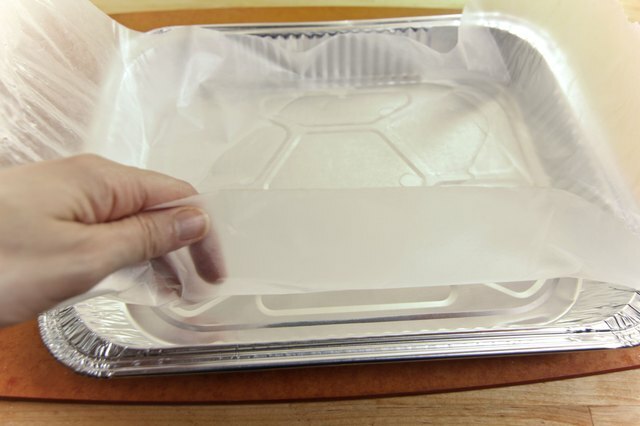 Cut a piece of parchment paper to fit the bottom and the sides of the aluminum pan. Spray the pan with nonstick cooking spray and press the parchment paper against the bottom and sides of the pan, the spray will help hold the paper in place. Brown 1 lb. 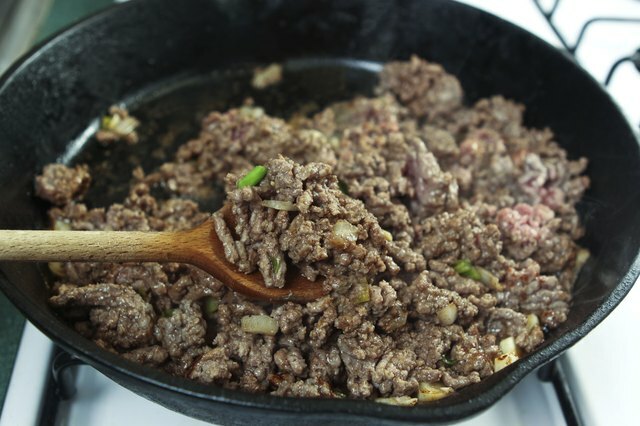 of ground beef in a large pan. Carefully pour the excess grease out of the pan. Add 32 oz. of spaghetti sauce and allow the sauce and meat to simmer over low heat for approximately five minutes. Stir together 32 oz. 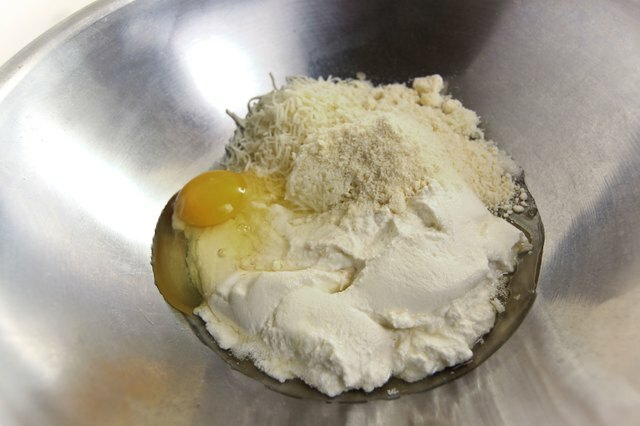 cottage cheese, 1 cup shredded mozzarella cheese, 2 eggs and 1/4 cup grated Parmesan cheese in a large mixing bowl. 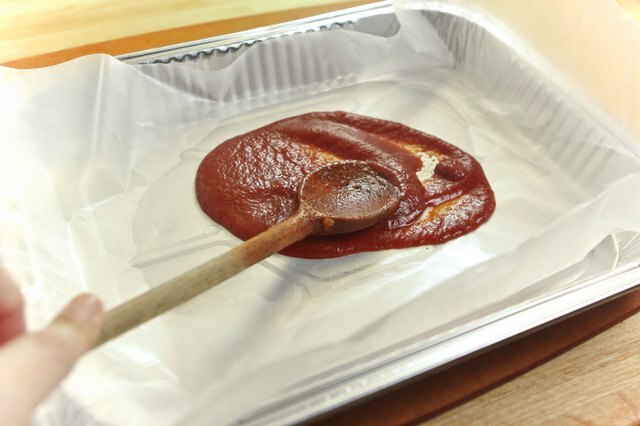 Pour 3/4 cup of the sauce and meat mixture into the bottom of the parchment-lined aluminum pan. Spread the sauce around with the back of a spoon to cover the bottom of the pan. 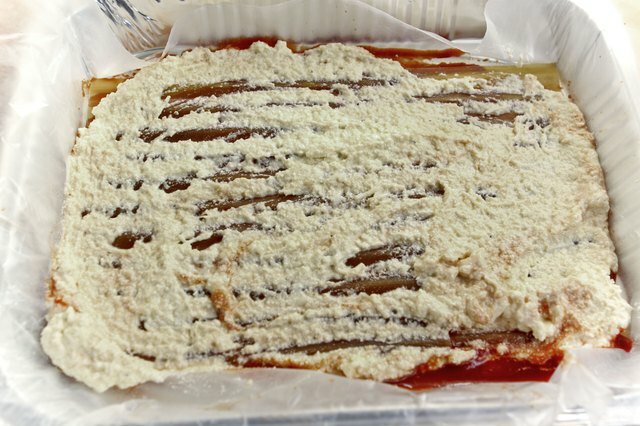 Layer 3 ruffled-edge, 11 inch by 2.5 inch uncooked lasagna noodles on top of the sauce, side by side, not overlapping. 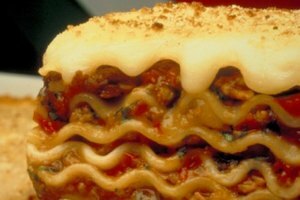 If your noodles are smaller or you would like more noodles in your lasagna you can add up to 5 noodles per layer. Top with about 1 1/2 cups of the cottage cheese mixture and 1/4 cup of sauce. Repeat these layers twice. 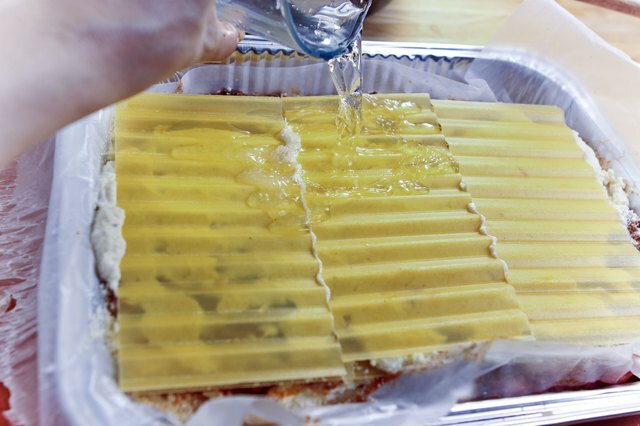 Pour 1/2 cup of water into the pan at the edges of the assembled lasagna. This water will cook the lasagna noodles as the lasagna bakes. 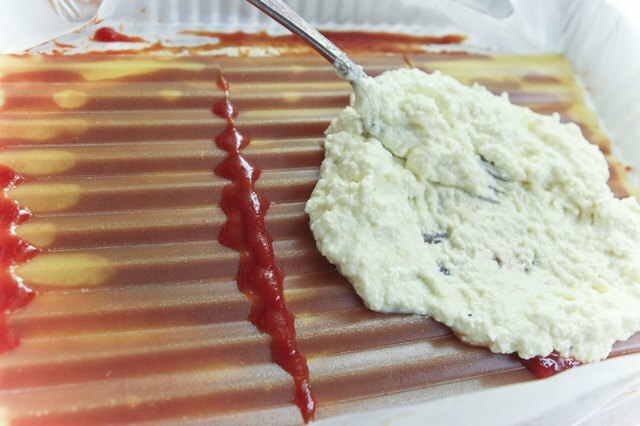 Pour the remaining sauce over the top of the lasagna and sprinkle with 2 cups of mozzarella cheese and 1/4 cup grated Parmesan cheese. 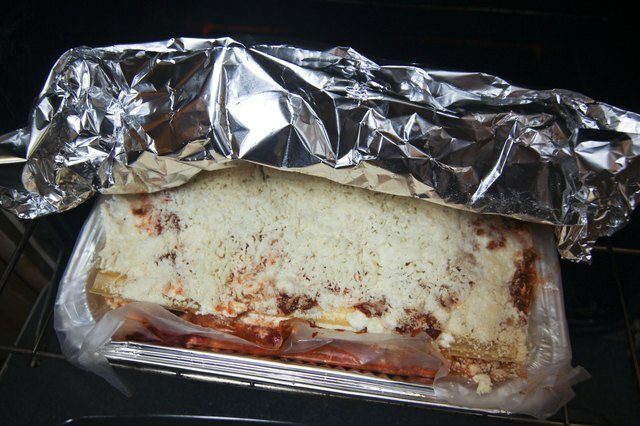 Cover the lasagna tightly with aluminum foil and bake at 350 degrees for approximately one hour. The lasagna is done when the noodles are tender and the cheese is melted.